Shows your buy and sell positions on the chart. Red arrows are short trades. Blue arrows are long trades. Right facing triangles indicate opening a position. 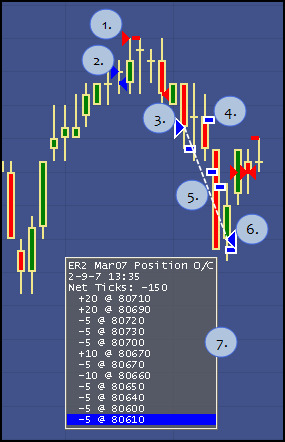 Dashes indicate market entry points while holding a position. Connecting lines can be displayed to tie the entry with the exit for a position. Left facing triangles indicate closing a position. Date and time of entry. The net result (in ticks) of the completed trades. Number of contracts and prices of each transaction. The Fill Indicator has a property that allows you to offset fills that are not in the correct position. Use the following table to determine the fill offset time from UTC for the listed exchange (a value of “0” indicates the exchange fill time is already in UTC). Right-click the Fill Indicator and select [Contract]:[Indicator] Properties (e.g., ESJul13FILL Properties) from the context menu. Enter the offset value from the Table in the Fill Offset (Hours) field.